1) Click in Windows search field and type "Disk Cleanup" and click it. 2) When it is done scanning, click the "Clean up system files" button at the bottom left of the form. 4) When it is done scanning, check the box that states "Temporary Windows installation files" and "Previous Windows installation(s)." 6) Click Delete Files button. 7) Click the Yes when it warns you about deleting previous Window installs. 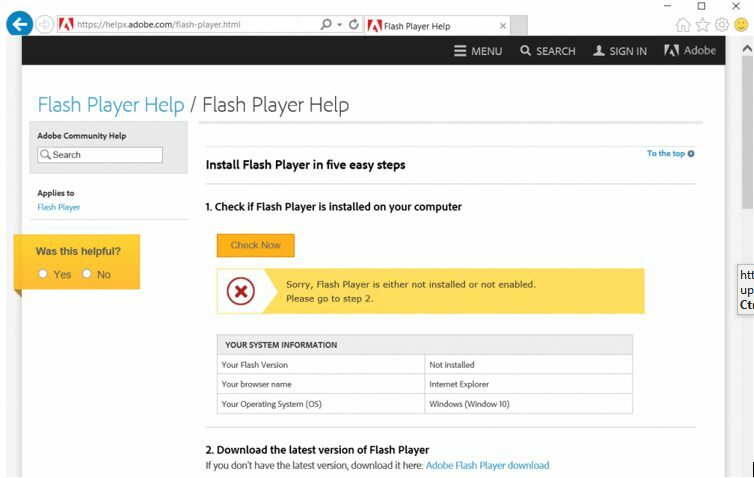 If your Microsoft Edge is having problems playing Flash videos in Microsoft Edge, you have come to the right place. it failed the “Test Flash Player” test. Flash is integrated into Internet Explorer and Microsoft Edge in Windows 10. The problem could be that the flash files on your computer are corrupt. Resolution: Replace the flash files from another Windows 10 computer. There may be security issues trying to delete the old files and adding the replacement files, so be sure to change the security settings ownership of both Flash folders to a user (like EVERYONE) that will give you the permissions.